Nov. 15- Keynote Presentation in NH and Comments for FSMA! As the 21 century gets underway, it appears ever more likely that we will face continued challenges and change at an unprecedented rate- likely even greater than experienced during the 20th century. As we face uncertainty in regards to climate, energy, government, and the global economy- we can fear change, scramble to react, or adapt appropriately and with intention. 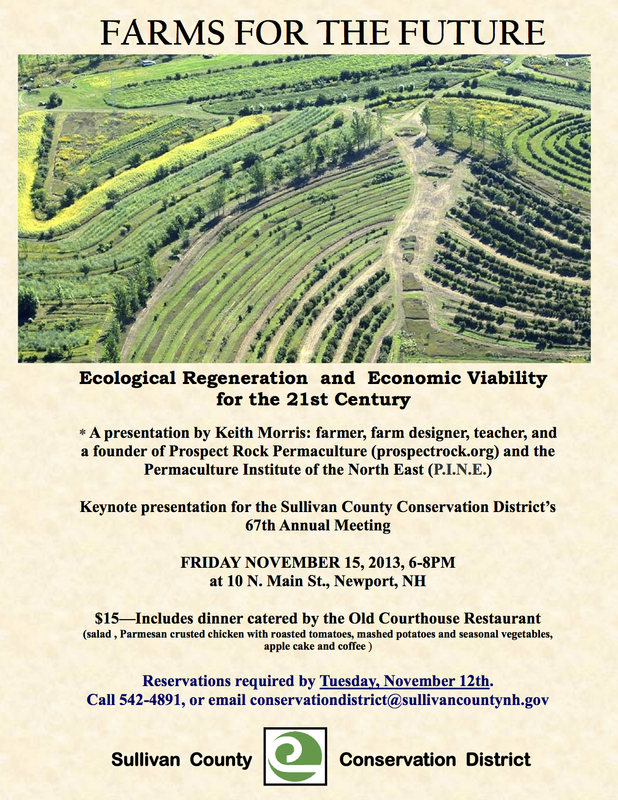 Join with professional farm designer Keith Morris to explore how the study of ecology, history, and ecological design can help us act on the tremendous opportunities we have at present to make our farms more resilient, ecologically regenerative, and economically viable with an eye towards healthy communities and a lasting legacy into the future. We’ll look to a few inspiring examples from here in the northeast and beyond of farms using permaculture to create health and abundance by combining tradition with new crops and techniques- focusing on the intersection of social and ecological health, and caring for future generations. On Friday, November 15 at 6 pm, you are invited to join us for the 67th Annual Awards Dinner for the Sullivan County Conservation District. There will be a farm-sourced meal, recognition for stand-out farms and educators, and an opportunity to weave connections between area veteran farmers, young and new growers/ homesteaders, extension agents, and state and local representatives looking to engage in making a viable agricultural future for the region. HAVE YOU HEARD ABOUT FSMA (the Food Safety Modernization & Safety Act)!? Comments are due by NOV. 15! The rules, as currently proposed, have the potential to be very damaging to many farms – especially those who are focused on veggies and fruits, or concerned about Food Sovereignty. RURAL VERMONT, NOFA VT, UVM EXTENSION, New England Farmers’ Union, and the VT Agency of Agriculture have pulled together some of the best analysis of what you need to know and what you CAN DO to add your voice to the protest over how these proposed rules could devastate small scale agriculture in the northeast. PLEASE CLICK HERE FOR AN AWESOME COLLECTION OF INFORMATION ON HOW TO LEARN MORE AND SUBMIT EFFECTIVE, INFORMED COMMENTS! We’ll also be presenting with MARK SHEPARD (whose farm is pictured in the flyer above) during this Winter’s NOFA MASS Conference on January 11. LASTLY- Our internationally recognized, farm-based PERMACULTURE DESIGN CERTIFICATION COURSE will be held this summer July 20 – August 1, and is already beginning to fill! Please reserve your space now, and feel free to share course information with potentially interested friends and networks.